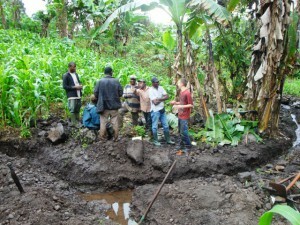 More groundwork for the water project. The Lower Wonjoku Community Portable Water Supply project which was commenced more than a month ago is still ongoing with more and more support and appreciation being received from community members. Another village community labor campaign was organized by the Chief and Chair Man last two Sundays with great success in terms of work done. Challenges to the project so far have been the volume of the water to serve the required population during the dry season when the rains will be less and the quality of the water due to the farming activities around the catchment area. To address these issues, Green Cameroon’s team has been working on identifying and sampling alternative sources to see if better volumes can be achieved. Also samples have been collected from the present source for testing just to make sure that water supplied through the project meets the required standards needed for portable water. The team is working in close collaboration with some professors and students from the Hydrology department of the University of Buea to ensure that best results are achieved. The team has also been working on developing a topographic map of the drainage/catchment area which aims at better understanding the water inflow, sketching the various construction possibilities, taking samples of water for analysis; measuring pH, temperature and electric conductivity of the water. It is expected that at the end of all these tests and analyses the Lower Wonjoku village community shall be able to benefit from free portable water supply with water quality that meets conventional standards. 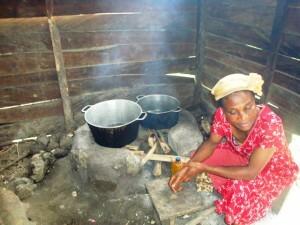 Forest Saving Stoves for the orphanages. Last week saw the coming together of both Green Cameroon’s Water Team and the Green Orphanages team for the construction of Forest Saving Stoves for the orphanages we work with under the Green Orphanages Program. It was once again an opportunity for the volunteers to show how communities can be of help and collaborate with the orphanages around them. The stoves were built for the orphanages free of charge and the feedback on their functionality is very positive. What the orphanages used before for cooking were our local three stone fire places which are associated with many risks and inefficiency in terms of energy consumption. 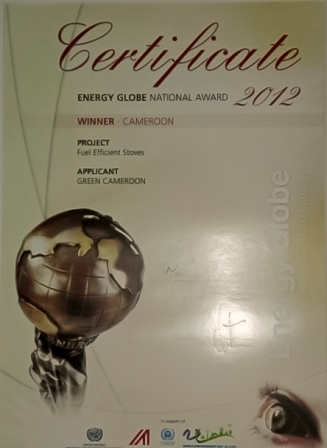 Green Cameroon’s team provided them with Innovative two-in-one fire places made out of Stones and cement. 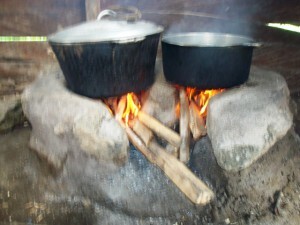 The orphanages are now able to cook faster, using less wood with reduced chances of burns.